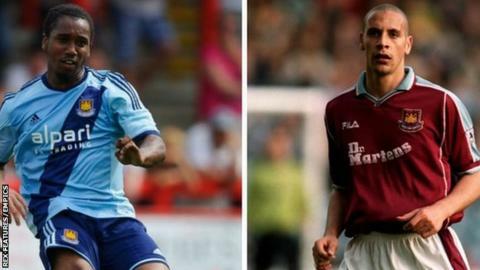 Colchester United's West Ham loanee Leo Chambers says he models himself on former England defender Rio Ferdinand. The 20-year-old helped the U's end their 19-game winless league run with a 2-1 victory at Bradford on Tuesday. "The only centre-half I've modelled my game on is Rio Ferdinand - he's come from 20 minutes down the road from me in south London," said Chambers. "He's come through West Ham's academy and we have sort of similar playing styles." Former England Under-19 international Chambers added to BBC Essex: "If I could be half the player he was, I'll be alright. "I've watched his game closely and one of the things he does is bring the ball out and is comfortable." The centre-back, who had about two years out of the game with injury, has helped League One's bottom club earn four points from two matches since he joined on a one-month loan. That started with a first clean sheet since former Hammers coach Kevin Keen took charge as manager for the Football League's worst defence - having conceded 79 league goals - against Shrewsbury on Saturday. And 6ft 1ins Chambers, who says he is not "the typical centre-half" because of his height, says taking on Bradford forward James Hanson was a tough test. "In under-21s football you're either playing against people your age or younger so you can get away with the extra touch because you can put your arm there or something," he said. "But in this league, as I found on Tuesday, you take an extra touch and there's a big hard man there. Sometimes you just have to get one step ahead and do the simple thing."